Tips and ideas about saving money on Christmas crafts. 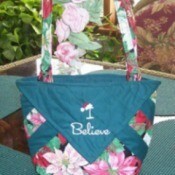 Christmas Tote BagThis is a Christmas tote bag made of quilting scraps. I made this tote bag from two squares of 30 by 30 inch material with batting in the middle. You then quilt them together and put a binding around the raw edges. 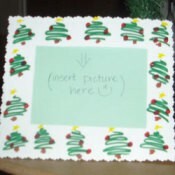 Christmas Picture FrameJust cut a hole out of the middle with an exacto knife and paint the lid green. 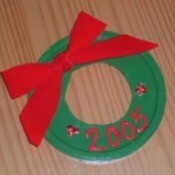 I hot glued on some red sequins for the holly berries and used fabric paint for the 2005. I made the bow out of red velvet. I used a twistie tie for the hanger on the back. Making a Nice Christmas on a BudgetMaking a Nice Christmas on a Budget. This request was originally published in 2005 and received numerous helpful responses. Picture Frame CardsIf you spend hours staring at Christmas cards at the store thinking about how impersonal it is to send pre-printed cards, then there is no better way for you to send out your own greetings than through these picture frame cards.